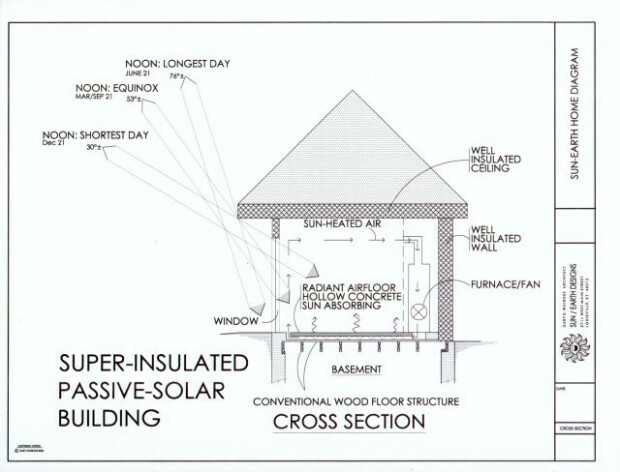 Watrous Associates Architects | What is Passive Solar? It’s a freezing cold, but sunny, day. You climb into your car and you’re surprised by how warm it is. You’ve just experienced passive solar heating. The car is warm because the sun has been shining in through the windows all day. Where Are The Rooftop Collectors? Rooftop collectors are typical only for “Active Solar” design. These characteristic roof mounted boxes generate either hot water or electricity. Sun-Earth Homes can incorporate active solar as “add-on” features at any time — budget permitting. How Do Sun-Earth Homes Work? Our Midwestern winters have plenty of cloudy, overcast days. But even on an overcast day, the south-facing windows of your Sun-Earth Home gather solar energy. And when the sun shines in through the south-facing glass, the concrete subfloor is heated as well as the air in the room. The warm air is drawn off near the ceiling and driven by a regular furnace fan into the house’s furnace ducts. The ductwork then delivers the passive solar heat into all the rooms through the hollow concrete subfloor. This cycle is repeated all day long, transmitting the solar heat to the floor which provides soothing radiation back to you at night. On cold, cloudy days the furnace functions completely normally, providing the fast heat-up of a regular gas-fired system as well as the benefits of radiant floor heating. Unlike many conventional homes, your Sun-Earth Home is naturally bright and cheerful in winter. Our designs provide you with a constant connection to nature and to the drama of the day and night sky. In the summer, our super insulation techniques cut your air-conditioning bills in half compoared to conventional construction. We use methods such as radiant barriers, natural ventilation, sunshading by trees and vegetation, whole house fans, and building placement on the site taking advantage of summer breezes — all further reducing colling costs. The designs by Watrous Associates Architects are based on national standards developed by the US Department of Energy and its National Renewable Energy Laboratory. Your Sun-Earth Home combines beauty and functionality and can help you save real money on utility costs. We’d love to tell you more — just call us today at (502) 776- 7007.